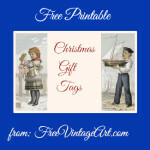 FreeVintageArt.com is all about vintage, public domain images for crafters and artisans to enjoy. It wouldn't be any fun if you couldn't safely use the images I've included here, so I've made every effort to ensure that every one of our free vintage images are in the public domain under American copyright law. Original publication information is included to honor the artists as well as document the copyright status of each free vintage image.